"The only person you are truly competing against, Wesley, is yourself." 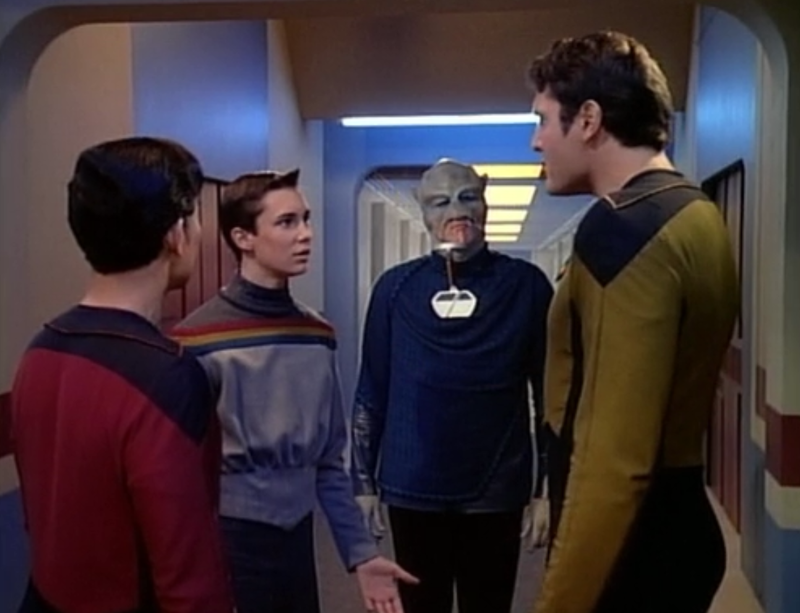 Wesley’s entrance exam to Starfleet Academy coincides with the arrival of Admiral Quinn–who menaces and threatens Picard and the Enterprise crew in an effort to root out a threat to the Federation. The opening of this episode gives a lot of context to why I liked Wesley, early on. Right away he’s trying to support his competition and bring people together, instead of using his intelligence to hurt others. This continues when he joins the Academy entrance exams. He doesn’t let praise go to his head, and he immediately notices the Mordock’s being left out, and goes to speak with him. Meanwhile, Admiral Quinn brings a friend, Commander Remmick, to investigate “something very wrong on this ship.” The resulting investigation threatens normal operations and leaves the crew confused and paranoid; one by one, they have to defend their choices and each others’ behaviors. I began to see the Riker we all came to know and love in this episode coming to Captain Picard’s defense. I also began to see and enjoy a lot of the character bonding that really marks this show. Maybe for the first time throughout the first season, a lot of the character interaction seems consistent. Wesley also shows tremendous personal growth. He has a sense of competition but also a sense of fair play which is a strange and wonderful quality for a native New Yorker to see! His final psych exam–and his understanding of the meaning behind it–were strangely moving. I was left wanting to know more about Starfleet’s internal problems–but also thrilled Earth and those problems were very far away from our heroes. I'm also glad Wesley isn't being taken by the Academy yet; while his maturity in helping others is impressive, he still has a quality of naivete and youth which the other candidates only emphasized. -How many times has the shuttle been stolen? Maybe they were right to question the ship security. Or maybe it's a tradition which began this season with "The Naked Now." -Riker does his trademark leg-over-the-chair move in this episode during his first interview with Remmick. It’s still pre-beard, so I don’t think he’s cute yet, but he’s getting there. Tac Officer Chang: Welcome. You are here because you are all top candidates. Although only one student will be chosen for the Academy, you have shown from the preliminary testing that any of you could easily qualify. Now this may be the most difficult exhausting experience of your life - and the most exciting challenge. Expect the unexpected. May you all do your best. Riker: Captain, may I speak frankly? Riker: As First Officer, I should be informed. I should know everything that you know. Picard: That's right, you should. Riker: Then what's this about? Remmick is going to turn this ship upside down. Riker: And my job is to see that this ship runs smoothly. Picard: Which you do very well. Riker: Sir, am I under investigation? Riker: And if you did? Picard: I couldn't tell you. Riker: I don't understand, sir. This is extremely frustrating. Wesley: Did you hear what she said, Mordock? She said I was cute. Wesley: You? I thought there was nothing that could frighten a Klingon warrior. Worf: Only fools have no fear. Wesley: I'm sorry, Lieutenant. I'm asking too many personal questions. Worf: It is very difficult for me to depend on anyone for anything. But especially for my life. Wesley: But on the Enterprise you do that every day. Everyone depends on everyone else to protect them. Wesley: So you overcame it? Worf: No. It is still my enemy. A solid episode. If not the grand heights of exciting, definitely a better entry than most in the first season. Three out of four overzealous pipsqueak investigators! I just rewatched the episode tonight and it was a lot better than I remembered. The crew are starting to feel like themselves, especially Picard and Riker, and Wesley was quite enjoyable, showing he had the experience and maturity to give Mordock help when it might have cost him the coveted slot. The slot thing didn't make sense, though. You'd think Star Fleet would want every overqualified and perfectly StarFleetable cadet it could get. And did anyone else think of popping a clutch when Picard got that kid to bounce the shuttlecraft off the atmo? It doesn't make sense that only the highest scoring applicant out of every four that applied makes it in.